Everyone loves to visit the buffet table, and the Amish Three Door Buffet-56" Wide is perfect for setting out dessert at Easter and appetizers before the Thanksgiving meal. Built with the solid wood of your choice, this buffet has three cabinets and three drawers along with a lovely surface to help host. 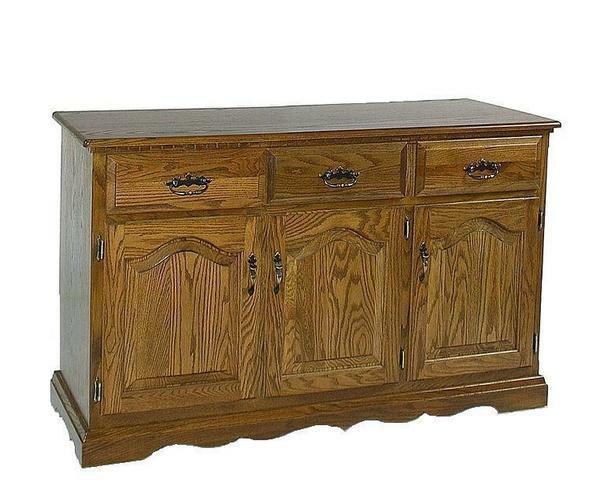 A buffet that can be part of your dining room or kitchen for ages, this Amish furniture is crafted by hand. With its scalloped base and raised panel doors, this 3 Door Buffet is graceful and charming. Please email or call us today if you'd like help with custom options or if you have any other questions. We thank you for shopping with DutchCrafters, the #1 online retailer of Amish furniture. I (finally) did the reviews for my lovely order, but I couldn't see how to attach a picture. I wanted to put some shots with the reviews so other people could see my furniture when they are trying to decide on their orders. The furniture is lovely! I know we will treasure it for years and years.